In the sunlit opening stood a tall figure wearing an unfamiliar military helmet. The backlit silhouette looked like a supernatural, a creature from another world. As if coming from a great distance and erupting through dense fog, I heard "Oh my God!" my first exposure to spoken English. Slave labor prisoner 86916, who served the Nazi Third Reich, had survived. My adolescent years from age twelve in Poland and now at nineteen in Austria were at an end as well. My education had been halted at the sixth grade. I was deprived of my adolescence with its schoolmate friendships, ball playing, a first crush and the emotion of teen-age "puppy love." The horror of war ended for me with my repatriation from Austria's Mauthausen concentration camp in May 1945, but a scar from a tattoo I cut from my arm would regularly remind me of both my prisoner number and the several camps in which I was interred. Weak and emaciated, I had the good fortune to be treated in an American field hospital. After my partial recovery, I was astonished to see what appeared to be British soldiers with a Star of David as their unit insignia. They were members of Jewish Brigade under the command of the British Army was recruited in July 1944 from Palestinian Jewish immigrants. A golden embroidered Star of David over two blue stripes, a modified Zionist flag, became the emblem of the brigade and it was incorporated into their shoulder patch. The unit fought in Italy as part of the British Eighth Army and Fifteenth Army group. When the war ended, members of the brigade searched for Holocaust survivors to provide them with aid and assisted those who wished to relocate. They especially played a key role in helping displaced Jews escape Europe for British Mandated Palestine; a task that many of its members continued after the Brigade was disbanded. The members of the brigade had allegiances with diverse political groups in Palestine, but all had the same goal of the establishment of a Jewish homeland state. One such group was called Irgun Tzvai Leumi (National Military Organization) under the command of Menachem Begin. A main objective was to recruit young strong survivors to help build a Jewish homeland in Palestine, the so-called "promised land." After I had sufficiently regained my health, I joined Irgun. They smuggled me into southern Italy and assigned to engage in intelligence activity for Irgun in Rome, Italy. After only a month my small unit received orders to leave Rome for the port of Genoa. When we arrived and met our contact, we were brought to a refurbished LST (Landing Ship Tank) and told that we were to replace the crew that had sailed her across the Atlantic Ocean and into the Mediterranean. The plan was to use the vessel to transport weapons and people to Israel. Not only was I finally to get to the Land of Israel myself, but I was going to help others to get there as well. LSTs were special logistical-transport warships used by the American navy in WWII. Relatively slow, ugly and ungainly, these 342-foot vessels transported tanks and troops mostly for amphibious invasions during World War II. They were designed to unload their cargo under enemy fire directly onto a beach and proved vital during the Normandy and Sicily invasions. LSTs had two huge steel doors at the bows that could be opened to unload the tanks that drove over a heavy steel ramp that was lowered onto a beach. The ship's bottom was flat out of necessity, so that the vessel could run aground onto a beach to discharge the mechanized heavy equipment it carried. Unfortunately this feature allowed an LST to easily pitch and roll when underway at sea making them efficient seasickness generators for the crew and/or passengers. After the World War II the United States Navy mostly decommissioned the LSTs or sold some for scrap. The Irgun purchased the decommissioned rusting LST USS 138. All her guns and other military installations had been removed; the steel bow doors were welded shut, all related mechanism disabled and most of her mechanical equipment was in need of repair. The ship was refurbished and registered in Panama as the cargo ship Altalena, a pseudonym of the Zionist leader Zèev Jabotinsky. A skeleton crew of mostly non-Jewish sailors was hired to man the vessel and disguise its true purpose and ownership. In January 1948 the Altalena left Norfolk, Virginia bound for Genoa, Italy, its mission a secret. The Jewish crew took over LST once she made port in Italy. The plan was to use the Altalena to transport weapons and people to the hoped-for the new State of Israel. For a young man full of patriotic zeal, an emotion that had been missing in my life, this was exciting! Each member of the Altalena's crew was given an English nickname because the Irgun did not want anybody in Genoa to know that we were Jews. I became Mike. And so the Altalena became my home for 158 days. We pretended that the Altalena was just another Panamanian cargo ship visiting and revisiting Mediterranean and North African ports hauling all kinds of cargo mostly between Marseilles, France and into the Atlantic to Casablanca, Morocco. My personal reward was experiencing some of the exotic life that these shores provided, something of which I had been deprived during my years in the concentration camps. Like all seagoing iron vessels, the decommissioned navy ship easily rusted. As one of the deckhands, I chipped the rust away down to clean bare metal, applied a coat of a red rust-inhibiting primer, before painting it with a blue/gray marine grade oil paint. It was simple and tedious, but a trivial job that had to be done; a far less arduous task than that I faced as a slave laborer. We had several lifeboats on board, one of which was a small landing craft itself. The captain was concerned that these small boats be in good working order because they might have to be used to land refuges on the Israeli shores. Another important job was to release the ship's bow doors by cutting through the welding and then repair its complex opening and closing system. This had to be done at sea to avoid being observed. This suspicious activity might be reported to Arab or British forces, hostile to Jewish immigration activities. I was assigned the dangerous job cutting through the weld. While underway, far from land, two of my fellow crewmen lowered me over the bow in a boatswain's chair. With an acetylene torch in my hand, I was suspended on a rope about twenty-five or thirty feet above water. I had to carefully cut through the welds using an ungainly torch. I could only do this exacting work when the sea was calm, precariously hanging and sometimes swinging above the ocean. During many hour-long sessions over several days, I succeeded in severing all the welds. In order to operate the huge doors, the defunct electric motors had to be refurbished. A shipmate nicknamed Augie had been an electrical engineer. He relished the challenge of figuring out how to reconnect wires and switches. After working on the problem for several days Augie linked the motors to the ship's electrical system, pushed a button and the bow doors rotated open. We all cheered. Among my duties as a crewman I stood watch in the crow's nest, a small platform on the tallest mast. Once there I scoured the horizon with binoculars and reported the position of any ship or potential problem spotted to the bridge below. Occasionally fierce windstorm churned up the Mediterranean Sea causing series of waves to lift the grunting ship and then violently dropped the vessel with a resounding bang. The Altalena became an oversized diver executing repeated huge belly flops. During these storms I tied myself to a rail to prevent the wind or waves from sweeping me off my precarious perch, an unforgettable feeling of utter helpless before the power of nature. We now prepared the ship for its intended mission. Although we acted like we were a Panamanian cargo ship, we anxiously awaited instructions to sail east to Israel that was being attacked by five Arab armies. The nascent state needed all the help it could get. The military order from the Irgun headquarters finally came. We set sail to Port-de-Bouc, France to pick up over 900 Holocaust survivors from assorted displaced persons camps, all desperately wanting to immigrate to Israel. Our secondary purpose was to transport a load of weapons, ammunition and other military supplies for Israel's War of Independence. While in Port-de-Bouc we guarded our ship closely. Anyone approaching the Altalena, whether from land or water, was viewed with apprehension. I had the early morning watch when a convoy of heavily loaded French military trucks approached the ship at dawn delivering the military cargo. For me this was an exhilarating sight. Longshoremen started unloading the trucks and moving the cargo into the ship's hold. Then they quit. Most of the dockworkers were Arabs from Morocco and Algiers and they had had discovered the ship's ownership and its likely destination. The Jewish crew was now forced to take on the job of loading of the ship, but in a reasonable in time it was completed. Shortly thereafter trucks loaded with refugees started arriving and these passengers quickly came onboard. On the next high tide, a French tugboat guided us out of the port and we left for Israel. It was Friday, 11 June 1948. The passage to the ancient Levant might be precarious. Our captain, Monroe Fine, was concerned that the British Navy might intercept us or the Arabs might attack us from the air so he set additional watches. Also to counter this threat, we sailed a zigzag course for nine days, thus slowing our approach to Israel. I was on lookout and the first onboard to see the Israeli coast. I yelled into the voice tube to the bridge below, "Land ahead at one o'clock." It was Saturday, 19 June 1948. We made a slow approach and stopped some distance to the west of the shore. We did not know exactly where we were. Waiting until evening, we lowered our small landing boat. An older more experienced crewman and I were selected to take the boat to shore along with an Irgun ranking official. A dim red light on dark shore guided us. When we got closer I spotted a man swimming in the sea. I asked him in Hebrew, "Where are we here?" In the typical, brash Israeli manner, he replied, "What do you mean where you are? You are at the Redding power plant." We now knew that the ship's position was near Tel Aviv's power plant and we radioed the captain that information. We landed the Irgun operative on a beach and returned to our darkened ship. The Altalena slowly cruised well offshore and, hopefully, out of sight. The next evening we moved north towards Kfar Vitkin. 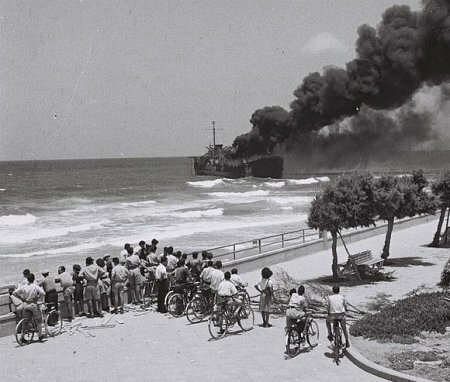 The Altalena, along with the Irgun's military commander Eliahu Lankin, reached the beach off Kfar Vitkin on 20 June 1948. There we off loaded most of our passengers sending them to shore. Towards late morning we set a southerly course toward Tel-Aviv. Something was wrong. An Israeli ship suddenly appeared over the horizon and started to shadow us. The Altalena arrived at a beach across from north Tel-Aviv's Frishman Street. Two of our small boats loaded with men headed toward shore under a white flag. Viewing the ship as a challenge to its authority, the newly formed defense forces of Israel, the Tzahal. Fired upon the Altalena . A warship, Israel's only corvette, fired a machinegun at us from the sea and artillery fire came at us from shore. A heavyset Altalena crewman named Sam who was standing nearby suffered a wound in the knee. I tended to him the best I could by placing a tourniquet above the wound, but I was unable to move him safely below deck. The bullets were now whistled at us from several directions, many of them pinging off the ship's bulkhead. The captain gave an order to haul in the stern anchor (a kedge) and, in turn, pull the vessel stern-first off the beach back to open sea. We moved only a short distance then stopped abruptly with a shudder. The Altalena had grounded on the sunken wreckage of another ship. Suddenly, an artillery shell struck the ship, causing an explosion. Thick black smoke rose from an open cargo hatch. The Altalena was on fire. Captain Fine reluctantly gave the order to abandon ship. I stripped to just my trousers and a life jacket, but kept my big hunting knife, a souvenir of the episode that I still have to this day. Bullets continued whizzing around me. I jumped off the stern to have the ship between the shooters on land and me. I swam away from the now exploding and burning ship. Israeli machinegun bullets shattered the placid surface seawater around me with a popping sound. The projectile entry-points produced small orange and black geysers reflecting the light from the blazing ship I had just abandoned. First I headed away from the shore into the open sea to the west then I slowly turned towards the beach. The orange life jacket hampered my swimming and presented a potential target, so I discarded it. I swam for approximately four or five hours until dusk. At about this time I spotted a large pipeline coming from the land into the sea. It was the North Tel Aviv sewer line. I swam behind it and reached the beach, completely exhausted. Exhausted, I dragged my body onto a sandy beach, the shore of my ancestral "Promised Land." At that moment, it did not seem very promising. Luckily two strangers picked me up and reunited me with some of the surviving crew. It was Tuesday, 22 June 1948. This is how my Altalena odyssey ended. I did not know why we received such a hostile reception, but in time I found out. There was a convoluted and complex struggle between several novo-Israeli political factions grappling for power. Several parties were discussing the political makeup of Israel's nascent Defense Force. David Ben-Gurion was the leader of more conventional forces like the Haganah (Hebrew for defense) and Menachem Begin was a commander of the militant guerrilla-like Irgun. Begin had demanded that 20% of all arms onboard the Altalena would be retained by Irgun forces to be used in its attempt to take military control of Jerusalem. The negotiations subsequently broke down between Ben-Gurion and Begin. Ben-Gurion delivered an ultimatum to Begin stating that the Altalena would be attacked if the Irgun did not relinquish it cargo to Ben-Gurion's Israel Defense Forces. When Began refused, artillery and small arms fire erupted from both the shore and sea. The Altalena was stranded roughly one hundred meters from the beach when an explosion ripped through the ship igniting a devastating fire. The human cost was sixteen Irgun men and three Israel Defense Force soldiers killed, dozens more wounded. After the sinking of the Altalena, approximately 200 Irgun fighters were arrested, but were soon released due to public pressure. The Altalena incident had great partisan costs involving some of Israel's most renowned early political figures resulting in animosity that festered in the nation for many years. This is a true story, a narrative about "Mike's" arrival in Israel. He requested that this memoir be quasi-anonymous, evocative of many Holocaust survivor stories of those who eventually made it to "the promised land." This ex-slave laborer, Israeli soldier, and blue-collar mechanic and welder became a scholar earning both bachelor and master's mechanical engineer degrees from two prestigious American universities. Taking advantage of an opportunity to do research in his field in the United States, he produced eleven patents. His greatest source of pride, however, was his wonderful family and his many Israeli and American friends. Sadly, Nathan (aka Natan) died peacefully in January 2015.